Ross Eaton has a look at the Ligue 1 clash between defending champions Monaco and fellow title challengers, Nice. After interesting transfer windows from both OGC Nice and AS Monaco, the sides would meet in the Ligue 1, with both having been part of the title race the previous season. Lucien Favre and Leonardo Jardim’s 4-4-2 systems, which share many similar traits, would clash in a battle between two teams who will undoubtedly be aiming for some of the highest positions in France’s most prestigious domestic league. A relatively poor start by Nice contrast to their opponent’s Monaco, who have been unstoppable as they have picked up the maximum of twelve points from their four games so far. Favre chose the 4-4-2 as we have seen him commonly deploy previously. Cardinale was the GK. Souquet, Marlon, Le Marchand and Christopher Jallet made up the four-man backline. As central-midfield controllers was a double-pivot of Vincent Koziello and Seri. Right of midfield was Saint-Maximin, with Lees-Melou on the other side. Plea played as a number 9, with Mario Balotelli alongside him, perhaps being considered a 9.5. Monaco too used their 4-4-2 as expected. In goal was Daniel Subasic, with Sidibe, Kamil Glik, Jemerson and Jorge making up the backline. Fabinho played as a lone pivot, with Joao Moutinho ahead of him as a variably positioned #8. Rony Lopes and Lemar played as the wide midfielders for Les Monegasques. Radamel Falcao and Adama Diakhaby were the forwards. With Monaco having such a central-focus in making progression through the three central lanes (right halfspace-centre-left halfspace), having a number of patterns and common actions in attempt to do so, Nice clearly realised the need to prevent clean, or any, Monaco progression here. 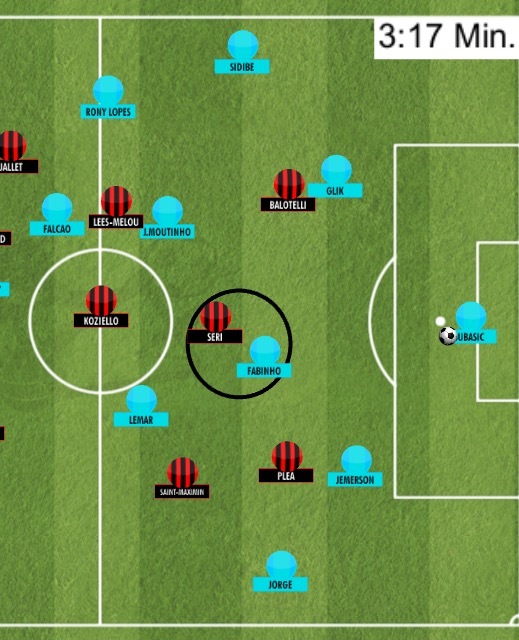 Positively for Nice, their boss Favre has excelled in previous jobs at defending the central spaces and even controlling them out of possession, in a rigid 4-4-2. For Monaco, Fabinho was pivotal in the first two phases. His dropping movements to receive and make a progressional action in these early phases were necessary for success in the majority of Monaco’s build-ups. Nice knew of Fabinho’s importance here, and used strong midfielder Jean Seri to defend against him in these situations. Particularly in phase one, though also in two, Seri would cover Fabinho by retaining a pressing distance on him, making the Brazilian midfielder receiving the ball very dangerous. By regularly eliminating Monaco’s main player in build-up, this did two things – it significantly weakened Monaco’s build-up as not only had they lost their key player in this phase, Monaco were also forced to commonly build through weaker players and zones. This was the centre-backs. Though Glik and Jemerson are relatively good build-up players, making great progress in their ability here in recent times, the pair are not outstanding, and a bit sloppy compared to other top defenders. Nice forced these central defenders to be far more involved than what would be ideal for Monaco. With Fabinho frequently marked-out, Nice decided to leave the central defenders as an option for Subasic. Encouraging the pass from goalkeeper to centre-back, Plea/Balotelli (ball-near of the two) would press lightly from an angle covering the inside lanes, forcing a dribble or pass onto the wing by Monaco ‘s ball-carrying centre-back. With Nice forcing Monaco to make their first attempt at a progressional action through the wing/full-backs, there was little option variability or unpredictability from here. With only two lines (straight and diagonally forward) allowing for direct progression up the pitch, it is clear the wing is typically not as efficient as the central spaces for progression. With there still being two available routes potentially allowing Monaco to progress from this deep wing position, Nice still had some more defending to do, and they certainly did this well. Nice left these two passing options (forwards to wing and diagonally inside to near halfspace) open (similarly to how they done so with the centre-backs in phase one) in order to encourage Monaco to pass into traps. Above, we can see how Nice allowed Monaco to pass from the non-dangerous wide position into traps. The passes Monaco were allowed to play here were into areas where Nice would be able to defend the action by the receiver. Dribbling was usually unsuccessful from the receiver here, as the Nice defender would normally have dynamic superiority as they moved towards the receiver whilst the pass was played, being able to cover the planned route. This was usually done by the full-back, preventing him turning and dribbling forward. Passing back inside for the receiver was also made difficult, as a Nice player, typically the wide-midfielder, would cover the angle between the player positioned on the wing and the player in the halfspace. Throughout the match, Nice were very effective in their prevention of Monaco access to the central spaces, particularly in the first phases of build-up, which is often so pivotal for clean progression. The compactness and defensive overloads of Nice in the central lane made angles few and access difficult, with it being very risky to do so. Even on the few occasions where Monaco did threaten to progress through the centre, it was clear it was extremely complicated, as it required almost perfectly timed movements and combinations in such tight spaces. Resulting in Nice’s second goal, as well as being the phase of play in which The Eagles found themselves a number of other great goal-scoring opportunities, the transition following a turnover in favour of Nice was imperative to the playing of this match. Used commonly by Favre’s 4-4-2 teams, the fast counter-attack from a low block position is often one of the primary methods of attack from the Swiss boss’ teams. With Nice often finding themselves in a 4-4-2 deep block, with Monaco frequently pushing numbers of players beyond the ball whilst in possession, the scenario was typical for an excellent counter-attacking performance. This was exactly what Nice produced, and Monaco (unwillingly) set the scene for. The instant reaction to a turnover, with Nice gaining the ball from Monaco, was for Monaco to counterpress. This was often done individually, or at most in a pair, with Monaco not being willing to offer numerous bodies in the initial counterpress. With Nice being strong in combinations, due to their individual quality and strong ball-local structures here, they usually were able to escape the rather weak Monaco counterpress. Effectively, this meant Monaco were often wasting a defender by throwing him into a situation to press as a lone wolf in a strong local possessional structure. Following the escape of the initial counterpress through local combinations, Nice would often look towards their wide players as they aimed to progress quickly and directly. When Saint-Maximin was the receiver, a dribble was expected. The winger has outstanding pace, and there was often a large space wide on the wing where Jorge vacated as he pushed higher onto the wing. When Lees-Melou, the left midfielder, was the man, there was more chance of a through ball to a runner, or another combination, due to his more technical attacking style compared to the dynamic Saint-Maximin. When winger was in possession, teammates up the pitch supporting would begin making movements. Movements we commonly saw from Nice attackers were peeling away from the ball-carrier, towards the ball-far halfspace. With the ball-carrier usually being the sole focus for defenders amidst the chaos of a counter-attack, these peeling movements towards the far-side allowed Nice to have attackers in an area which the opposition were not controlling. Any access into these spaces would see Nice with a huge superiority. Monaco’s neglect of the uncontrolled far-side when defending counter-attacks was a large problem. They were very ball-orientated as nice counter-attacked, with their defenders usually all choosing to shift closer to ball-carrier with little consideration of other runners. 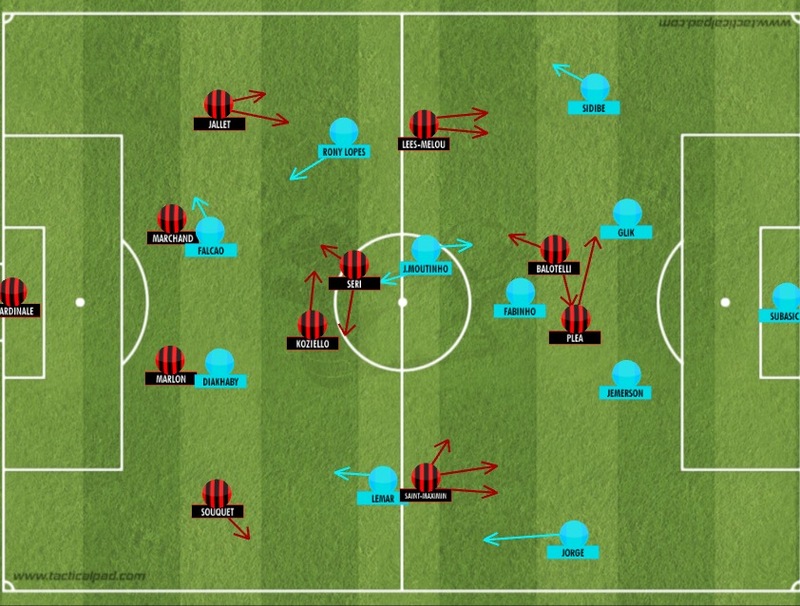 This created a number of dangerous counter-attacking chances for Nice throughout the game, as they played switching passes to runners peeling away on the defensively uncontrolled far-side. A 4-0 victory for Lucien Favre’s Eagles could not even be considered a flattering scoreline. Though Monaco retained deep possession for prolonged periods at times in the match, the control remained in Nice’s hands throughout the full match. Their defensive solidity which denied Monaco any central access combined with the constant threat of an intense direct press allowed them to dominate the majority of phases of play even without all the possession. The defending Ligue 1 champions produced a blunt performance. Their lack of efficient, clean progression and non-existent threat on the last line put Nice in very little danger throughout the game.